How many times have you tried to watch a video, or play music on your PC or laptop and you’ve heard nothing / or had the sound too loud because the audio is playing to headphones when you wanted it played on speakers, or speakers when you wanted it playing on headphones? 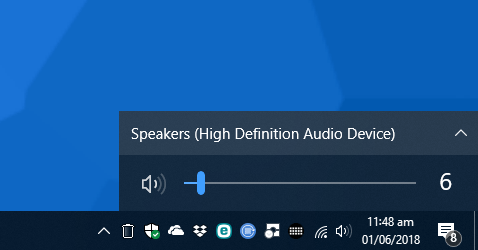 In Windows 10 it’s easy to change the current audio device, click or tap the speaker icon in the System tray in the right corner of the Taskbar. Note you may first need to click the up arrow (^) to unhide the icon. This displays a pop-up with the volume slider, but has an up arrow in its top right corner. Clicking or tapping that up arrow reveals a full list of all the audio devices installed and available on your PC, including any headphones, external Bluetooth speakers, and monitor speakers. Changing the audio device is a simple matter of finding the audio device you want from the list, and clicking it. 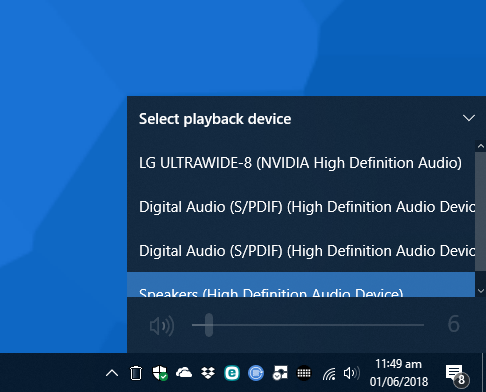 You can change the audio device back at any time by following the same procedure, so if your PC doesn’t automatically switch the audio to your headphones when you plug them in, makes it quick, easy and simple to manage manually when you need to.